Your computer is a graveyard of files. Files have been left behind by programs you deleted or uninsatll. Temporary files created by your computer are taking up space. The result? Your computer's performance is hurt, and your time is wasted. Tenebril Uninstaller is the solution. Tenebril Uninstaller allows you to add and remove software from your computer with confidence, knowing that lost files and other remnants of old software will not be left behind and cannot clutter your computer. The uninstaller software cleans up after software that is running on your computer, removing temporary files, cookies and cache elements. The Uninstaller also puts you in control over what programs run when you start your computer. Altogether, the Tenebril Uninstaller is a suite of uninstaller program designed for computer users of all levels. Installer feature monitors all the changes a program makes when you install it. 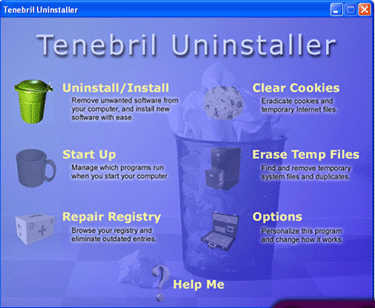 Tenebril Uninstaller remembers these changes, so when you uninstall the same program nothing is left behind. Manages cookies for you, letting you keep the ones you want and delete the ones you don't. Allows you to thoroughly remove software you don't want anymore, without leaving behind garbage on your computer. Gives you complete control over your start menu, letting you add and remove elements as you see fit. Lets you view and change which programs run when you first start your computer. Hunts down files you don't need so that you can safely remove them. Searches your registry for dead keys. Includes an undo feature that lets you remove keys with confidence, knowing you can always get them back. CleanMantra - Complete cleaning of system, Internet Cleaning, window washer, Cookie Cleaner, Plugin Cleaner,Scan now for Free. ERROR DOCTOR - PC Bug Doctor - The most advanced PC bug doctor software and PC error remover software on the market today!